Let the neighbours go crazy trying to outdo one another at the barbecue. 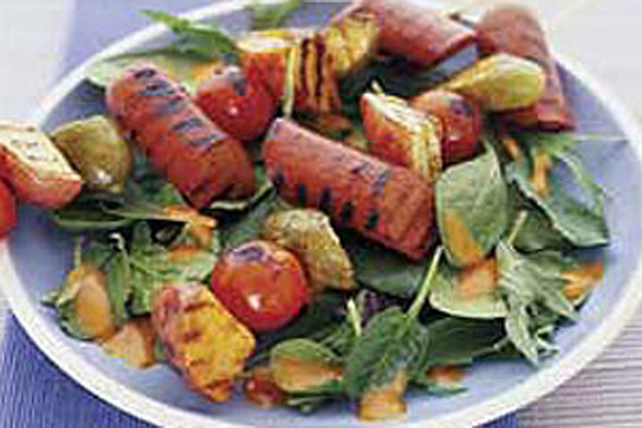 These easy-to-make Grilled Hot Dog Kabobs prove once again that nice and easy does it! Thread hot dogs onto 8 skewers alternately with tomatoes, pickles and potatoes; place in shallow dish. Pour dressing over kabobs; turn to evenly coat kabob ingredients with dressing. Refrigerate 10 min. Drain kabobs; discard dressing. Grill kabobs 5 min. on each side or until hot dogs are heated through. Serve over salad greens. If using wooden skewers, soak them in warm water for 30 min. before using to prevent them from burning on the barbecue. Partially cook potatoes in the microwave before threading onto skewers so they are done at the same time as the meat.